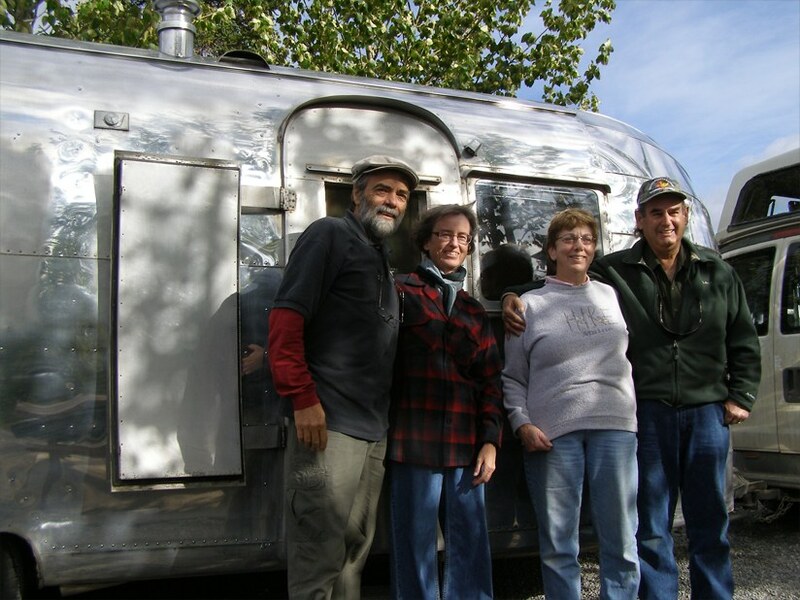 Why take an airplane when we can take an Airstream? Why fly 3,200 miles in a few hours when we can spend weeks on the road getting there? Why sit next to a sweaty, cranky stranger (or a too friendly one,) breathe stale, recirculated air full of germs while looking out at an endless blanket of clouds. We’d rather be in the comfort of our own vehicle, breathe fresh air all day long, watch the clouds above us shift shapes while experiencing every inch of every change in landscape and culture along the way from our home in southern Utah, through Idaho, Montana, into Canada; Alberta, British Columbia, the Yukon Territory and back into the U.S. at the Alaska border, then on to Fairbanks. What a true adventure that would be, and we’re doing it! It all began two years ago when a friend with the Fairbanks Watercolor Society worked to set up a 5-day workshop teaching gig for Spike in Fairbanks, scheduled for September, 2011. From the first we knew we’d rather drive than fly. Moonshadow (our 1955 Airstream) was in the beginning stages of restoration. Plans for a complete take-apart-to-the-frame and rebuild in 2011-12 were postponed as we prepared her instead for a long, sometimes rough journey northward. As plans progressed Sue was able to line up a 2-day workshop for a group of Fairbanks book artists. We spent a busy summer working on Moonshadow inside and out, preparing materials for our workshops as well as doing art exhibits in Taos, Santa Fe and southern Utah. 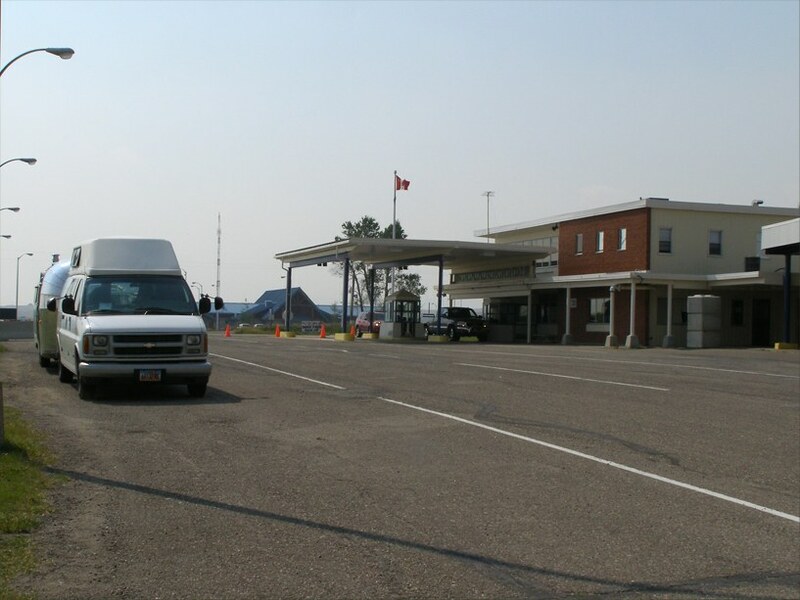 It was with relief and excited anticipation we hit the road at last on August 29th. 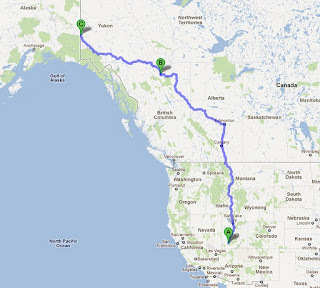 We arrived in Fairbanks September 9th after twelve days and 3,400 miles (due to side trips.) What follows are photos and stories from the first leg of our trip. August 30th, one and a half long days of driving, 941 miles from home, we cross into Alberta, Canada from Montana at the Port of Carway, an out of the way location west of the busy I-15 customs station. We were put through the full process - show passports, background checks, van and trailer search - but were back on our way within 15 minutes. We drove through Calgary during the 5:00 PM rush-hour in a drenching downpour. The next day the sky cleared as we by-passed Edmonton (to avoid the morning rush-hour.) We enjoyed a sunny day across Alberta. We begin to see wildlife along the roadside. This caribou gave us a good shot before disappearing into the forest. This was the first of many caribou sightings ahead. 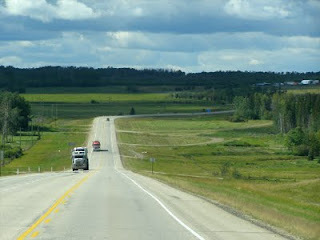 We connected with the Alaska Highway in Dawson Creek BC, Canada on day 4, mile 1,666 of our trip. We re-set our trip-meter to zero because our Milepost guide book is based on mileages from specific starting points. The Alaska Highway starts in Dawson Creek at official mile 0, which is where construction on the road began in 1942. 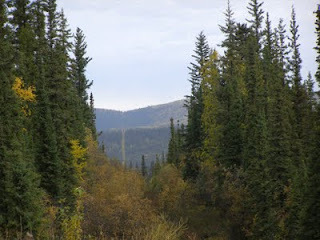 The highway officially ends at Delta Junction in Alaska at historic milepost 1422. 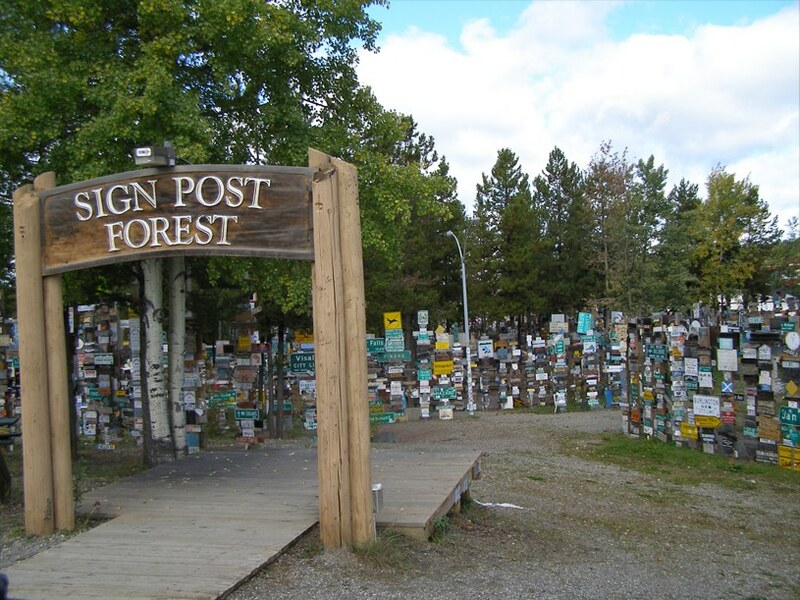 Improvements to the road over the years have straightened, leveled and re-routed some areas so current mileposts no longer match the historic mileposts, in addition, in the mid-1970s Canada switched to kilometers. Some of the historic mile markers are still in place. 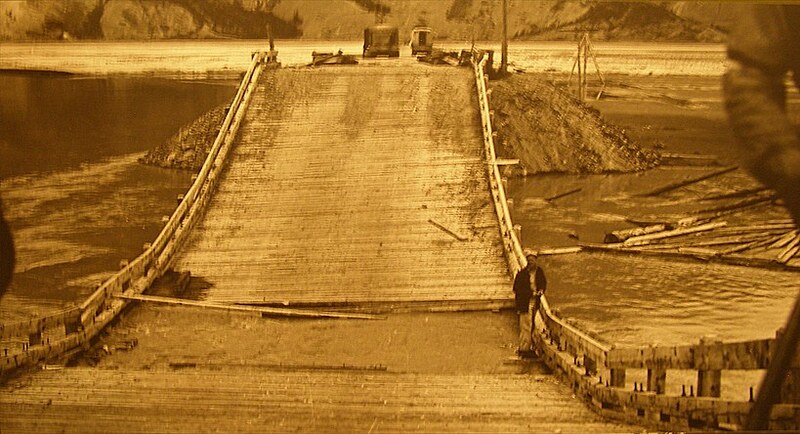 When the Japanese bombed Pearl Harbor the need for a roadway from the rest of the US to Alaska was urgently needed to transport troops and equipment to defend the coast. Thousands of US soldiers were sent to Dawson Creek and other locations along the chosen route. Construction began in March, 1942 and was completed on October 29, of the same year. It was a rudimentary road passable only by military vehicles. 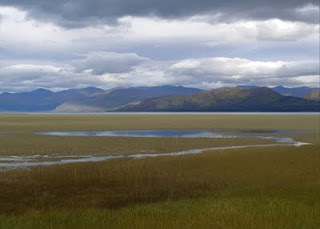 It was called the ALCAN (Alaska-Canada) by the military. 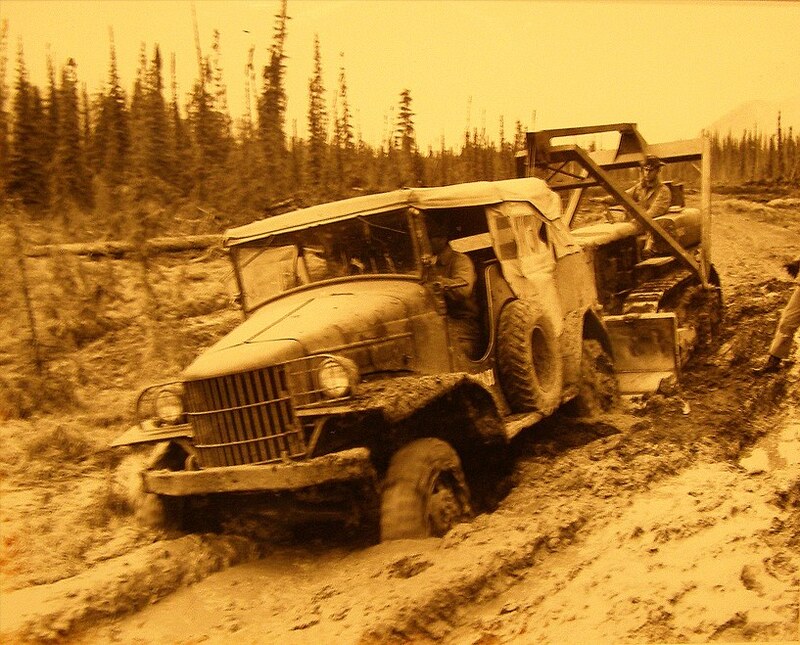 It was opened to civilian use in 1948 and renamed the Alaska Highway. Day five on the road we arrive at Muncho Lake, B.C., ready for R&R after four days pushing forward for as many miles as we could manage each day. We had planned ahead to make Muncho a sit-still break. 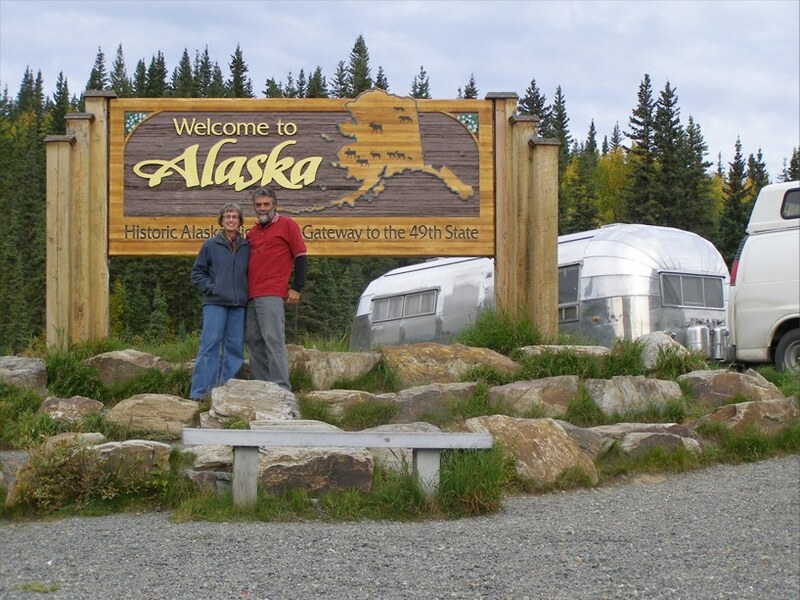 Back in July we’d read an article in the Airstream club’s monthly magazine about a trip to Alaska taken by Airstreaming couple Pam and George Millis. Muncho was one of the most beautiful campsites they found. We took their advice to make a stop there. We were happy to get an excellent site right next to the water. 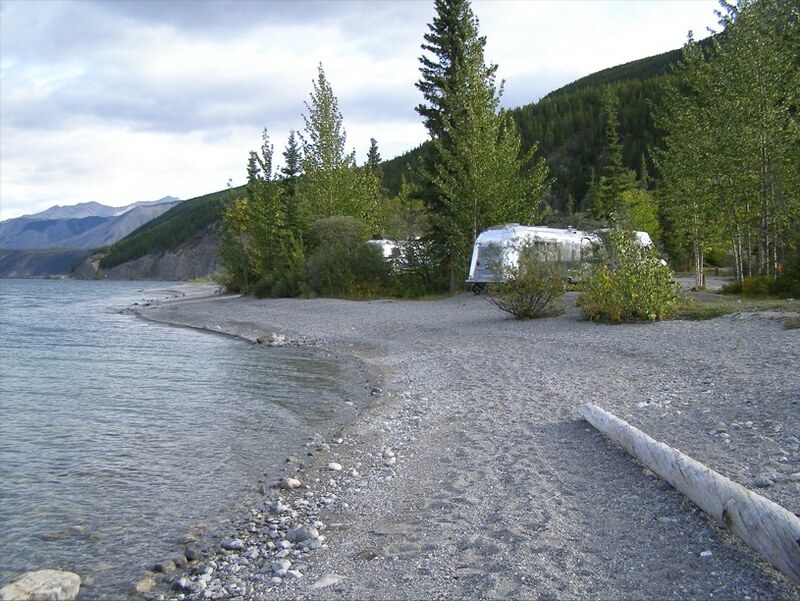 Shortly after we set up camp at Muncho, along came another Airstream and backed into the site right next to ours. 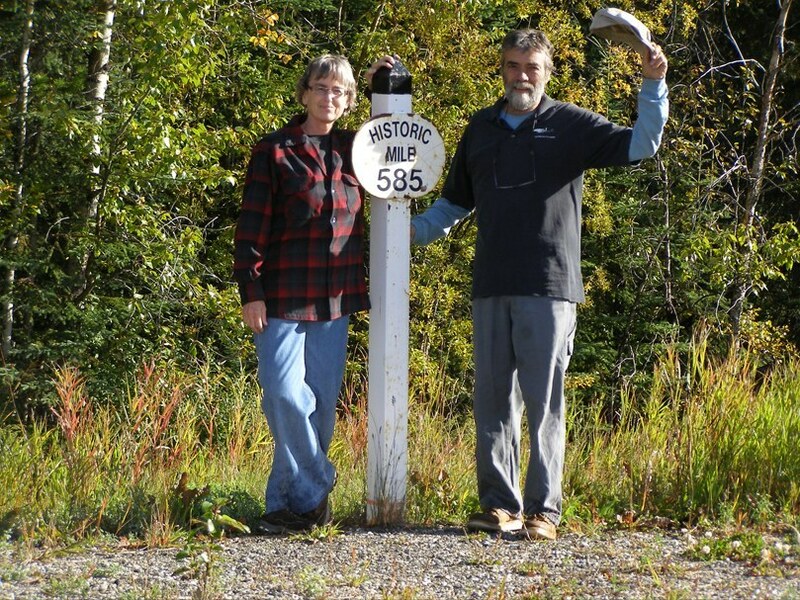 It wasn’t long before we were visiting with Pam and George Millis in person! 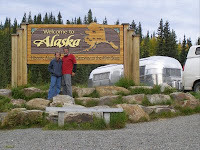 They were on their way home to Florida after their second grand tour of Alaska, on the road since May. 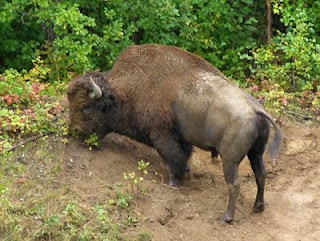 More roadside wildlife – this is one of two very large, intimidating bison bulls who were digging and rolling in the dirt on this slope near the highway. 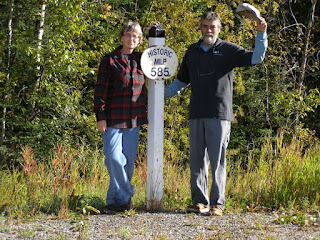 We make our way further north and cross the border into Yukon Territory at historic milepost 585 on the original 1942 Alaska-Canada (Al-Can) highway. 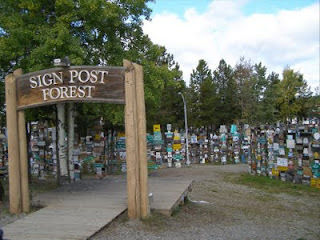 Signpost Forest, Watson Lake, Yukon Territory. The tradition of travelers posting a sign from their hometowns was begun by Clark K. Lindley, a U.S. Army soldier from Danville, IL. 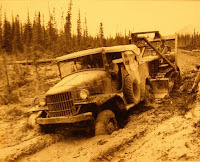 He was working on construction of the Alaska Hwy in 1942. Travelers continue to add to the collection which now numbers over 70,000. We forgot to steal a sign from Parowan before we left home. Maybe next time. 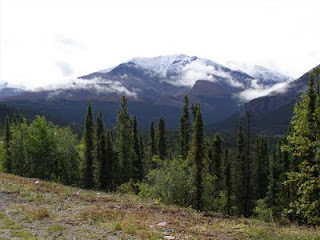 Yukon landscape is dramatic. The further north we continue, the more snow on the mountains and the more autumn colors. We had off and on rain with dramatic stormy skies for much of our drive across Canada. A view of Kluane Lake as we drive the east boundary of Kluane National Park in Yukon Territory, Canada. There’s plenty of water up here! Day 9 – Back in the U.S.A. - we reached the Alaska border 2,876 miles from Parowan, Utah, 242.7 gallons of gas. 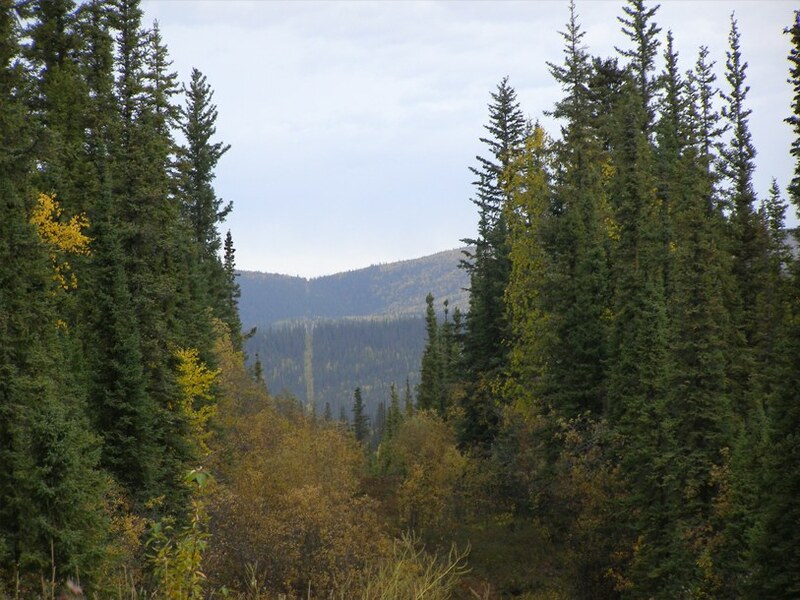 This photo looks north along a 20 ft. wide swath cut by surveyors in 1904-1920 along the 141st meridian, part of the boundary between Alaska and Canada extending from the Arctic Ocean 600 miles to the north to 250 miles south of this point. Hey, looks like this took about 5 minutes (oh I mean hours) to write and post. smiling... Can't wait for the next chapter in this saga. I know you're just getting warmed up and will have lots more exciting adventures to relate. How every artist should fly..lol!!!! blessings to you both, be safe and see you soon. All this is looking really amazing! I am so happy for you two! Keep up the good work. 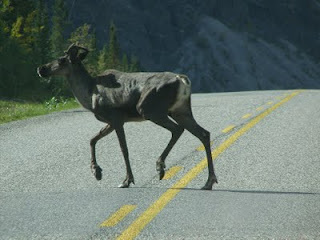 That photo of caribou is a rare one!